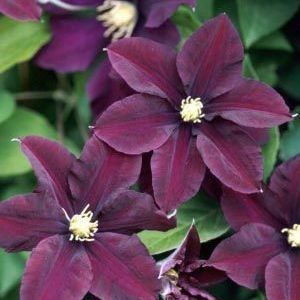 Clematis Warsaw Nike, Clematis 'Warsaw Nike', produces mysteriously dark violet-red 5" flowers that have a velvety texture with contrasting golden stamens. The ruffled petals overlap each other and have curled edges. 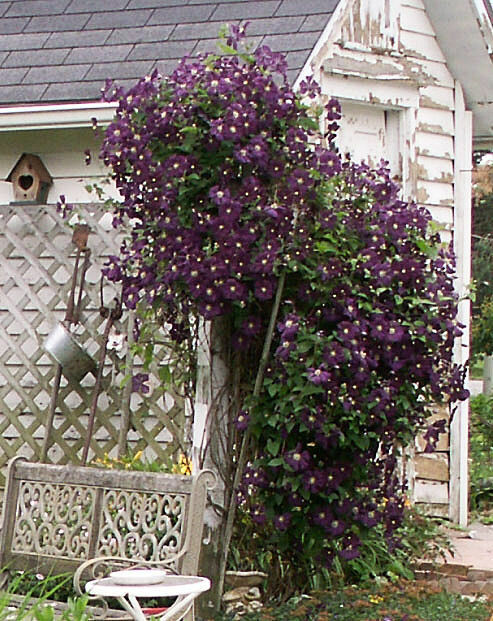 'Warsaw Nike' is more tolerant of shady sites and poor soils than most clematis. 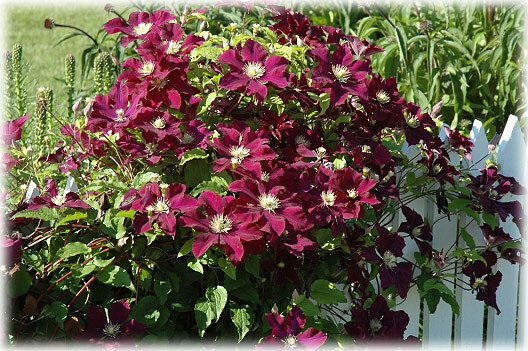 Clematis 'Warsaw Nike' needs a supporting structure to grow properly, and it is easy to grow with a rich, porous, alkaline soil that has plenty of room for the roots to spread. Best performance is when the tops are in full sunlight and the roots are shaded, but will thrive and bloom in shade. Apply a generous mulch or a shallow-rooted ground cover near the base of the vine. Very reliable performers once established; they take a season or two. Prune lightly above the new leaf buds in early spring and remove any dead or weak stems. I knew what it was and was so excited!! I couldn't remember the name but a little help from my friend Sheri and I found the name: Warsaw Nike Clematis. I was thinking of buying a couple of these this spring but then when I read how to plant them I wasn't confident I would do it right so I decided I had already taken on enough for this year but now I have them already so it's good I waited! I had transplanted part of this vine to another location and it's already started a couple new vines so I know the roots are happy. I look forward to it growing and filling that space next year. Isn't it fun finding all the great things people leave behind (when you move into a new house)? Anyways, so as I always do with a new plant I post the care for it. The location should be sunny, for at least half of the day. For the proper Clematis care, your soil should be rich, loose, well-drained, soil that will permit the roots to run freely. With that said, You should realize that digging a little bity hole, and stuffing the roots of the Clematis into it, isn't going to allow it to do that, so... Dig the hole much bigger than needed, and put in that organic stuff! This gives the roots maxium aeration. When planting, spread the roots out and cover with soil. Press down lightly, and water well. The roots must become established before the top growth occurs. They like their tops to be in full sun, but their roots shaded. Applying a thick layer of garden mulch wil keep the roots shaded. The roots must become established before the top growth occurs. They like their tops to be in full sun, but their roots shaded. Be sure to keep watered during dry spells. 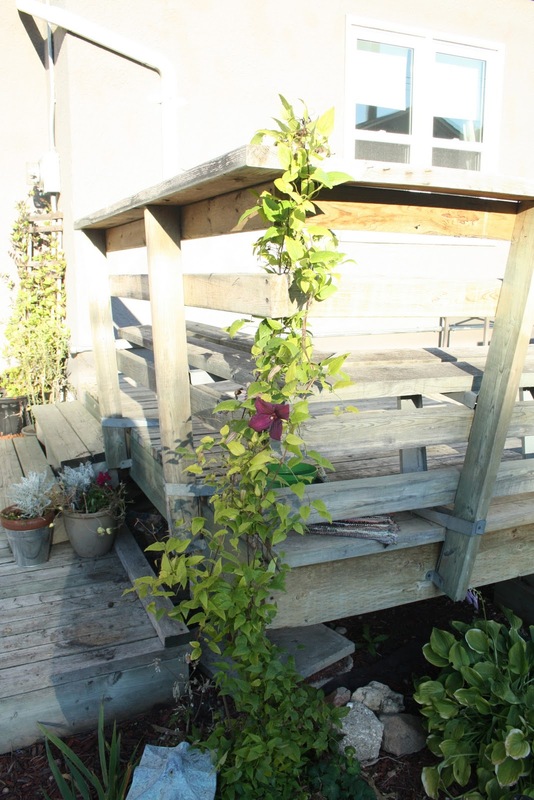 It is best to protect your Clematis from strong winds. Arbors and Trellis's are good supports for them. They look stunning growing up your mail box pole, or lamp post. Fertilize it with a balanced fertilizer once a year during the growing season. Put the fertilizer right on top of the mulch, no closer than 2-3 inches from the stems, to avoid burning. Be sure to water it in well.